Ok folks, time for me to go on a rant. I can’t promise I will follow one line of thought but bare with me. I sit now in our empty workshop room with flip charts scattered a little all over, some colourful post-its piled in a mess and one intimidating to do list gleaning on the white board. 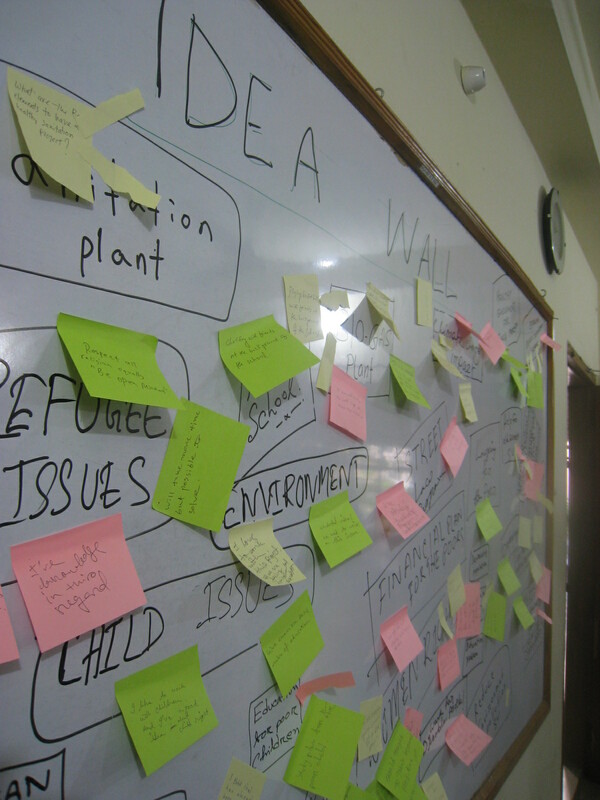 I would love to say that it’s the eve of our final day of workshop that has put me in this reflective mood but my mind has been running in and out of the development discourse ever since I arrived to Chittagong. Admittedly much of the inspiration for my thinking tangents have been inspired by conversations with our YPSA friends Subir and Mahabub, other times by the participants, other times by the programs we have seen, and often from my conversations with Gioel. The best part is that it has become quite natural to slip into our development discussions whether in a CNG ride, rickshaw, sitting on the terrace of the YPSA guesthouse, walking aimlessly down a dusty street or over tea and biscuits. In these moments of absolute brilliance I have been affirmed on a number of points. First that development should always be a collaborative process – when its not then we are failing to be genuine about bringing about serious changes in the community. What I have to offer as an individual could be great- but its value appreciates when I link arms with someone who shares my vision and has further skills to offer. Now scale that up to the level of NGOs, international institutions, development agencies, civil society, businesses, and government; and we have an impressive thing going on. How can we not have the instinct to at least begin every relationship with the simple healthy assumption that everyone has something to offer. Too often we make a premature assessment of what a person or organization is able to offer and then based on that judgement we decide whether or not the interaction is worth the time. Thing is – how can we judge if we haven’t given the adequate opportunity. The idea that ‘development’ is for a reserved number of ‘actors’ is a bit farfetched. Rather everyone has the ability to be a development actor – especially youth. This year more than any other I have repeatedly heard youth say “we are not just the future but the present!”. The fact alone that there was a room full of students day after day in our workshop is proof. My experience with training this group can very much be described as nourishing an instinct they already had. With little encouragement and no obligation whatsoever they have taken total ownership of this project design process and more often than not they delve so deeply into their planning that we need to remind them to take their tea break. Of course despite my firmness with them to respect the time, I could not be happier to see them getting so immersed in their discussions. If not for our limited time with them – I would love to see them continue those discussions and build off the energy and ideas that each person has to offer. There’s another reason why I glow with pride from getting to work with this group. 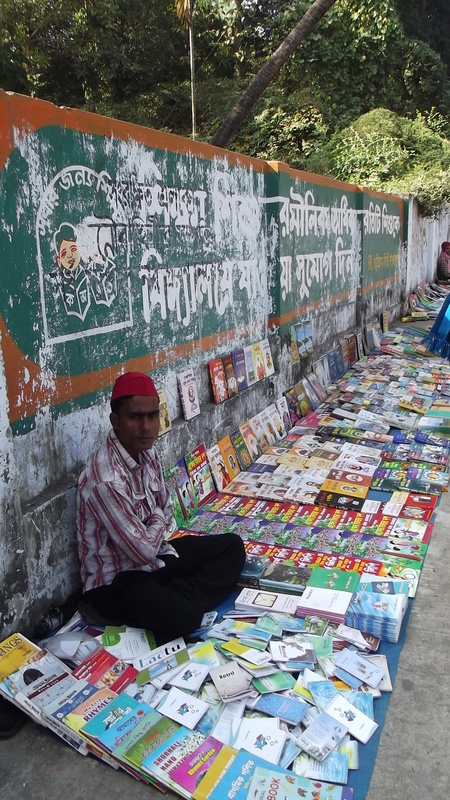 Even though Chittagong is a commercial district of Bangladesh – there is still a limited number of people with a firm grasp of English. Although as a requirement the students of this workshop had to have a good grasp of English, the reality is few of them have had the opportunity to practice. As a result their years of English study do not necessarily reflect what they are capable of. So although this workshop challenged these individuals to work and practice public presentations in English – not once did they become discouraged. Even in your native language, explaining concepts as complex as objectives, strategies and programs is not simple and yet they never faltered. Anyone who has ever tried to learn a language (and I have struggled with two of my own) knows that it is not easy, nor does it feel comfortable, to be in a position where: you are often asked to repeat yourself, you mess up the idiomatic expression (likely to be received by laughter – the laughing at-you-not-with-you kind), you are misunderstood and inventing words becomes the norm. It’s not easy – what’s harder is swallowing your pride and deciding to express yourself no matter how complicated the concepts. That is impressive so participants, my hat goes off to you! It was really encouraging in many ways. Because some of the actually never attended workshop or training as such. It seems to me that some of them are really great team player. If we can encourage, they can make great impact to their work and I am looking forward to that. I love to see this young people coming out from their own comfort zone and trying to make some positive and innovative changes. We’ll provide all possible support from our side.